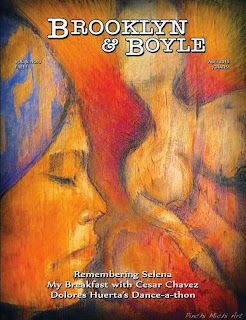 It is appropriate to point out that one of Selena Quintanilla's biggest hits was a song titled "Como la Flor," as we work hard to bring you another beautiful issue of Brooklyn & Boyle. We are happy to note that our new issue heralds the full blossom of the spring season, a season that brings us baseball, a Mother's Day celebration and a Father's Day celebration as well as Cinco de Mayo festivities across the country. Our upcoming April issue features a historical recollection from the year music fans the world over lost a cherished flower, a bright young star cut down in her prime. It is a piece from the archives of a reporter who was there providing a first hand perspective during the days following her death. We will also bring you a report from the recent tribute to Selena Quintanilla, the budding Latino music star who was lost tragically 20 years ago in Corpus Christi, Texas, here in downtown Los Angeles at La Plaza de Cultura y Artes. With a cover painting by San Pedro artist Michelle Júarez AKA Pinchi Michi titled Earth Angel (mixed media on wood panel), our newest issue will also offer a memoir by arts visionary, Radiotron founder and interdisciplinary artist Carmelo Alvarez which detail a breakfast he had with late labor leader Cesar Chavez, being that we just celebration what would have been the legendary Chicano activist's 88th birthday. 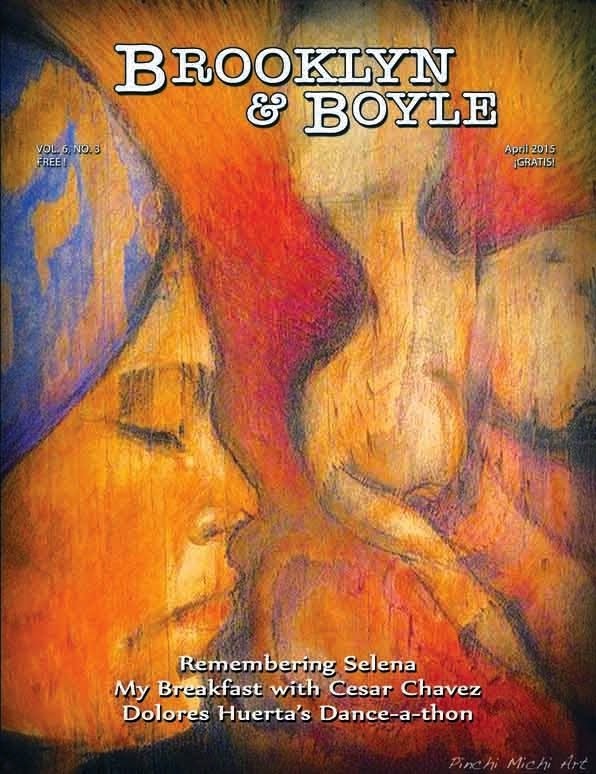 In honor of Mothers everywhere, Brooklyn & Boyle is pleased to offer our readers an opportunity to say "Feliz Día de la Madres" in print with a personal dedication page devote exclusively to messages for our moms. Please contact brooklynandboyle@gmail.com to see how you can salute your mother though us. These messages and memories, like those we've shared with mamá since she brought us into the world, will last forever and for about the price of a pair of movie ticketor less, you can publish your sentiment for all to see. Please remember that display advertising will close on Friday, April 10th, 2015. We are happy to help you look your best with an ad in the pages of Brooklyn & Boyle, and we look forward to hearing from you, even it's just to say hello, submit a story or give us constructive criticism.